“While winter weather is – hopefully – in the rear view mirror, Skate To Great’s skate drive season is still well underway. The not-for-profit organization gathered at Ryerson University’s Mattamy Athletic Centre on Wednesday to promote its national skate drive, urging Torontonians to drop off their used ice skates and hockey equipment. Together with various community partners, Skate To Great will then get the gear into the hands of at-risk youth, many of whom have not had the opportunity to enjoy the thrill of getting on the ice. Longtime Forest Hill resident Evan Kosiner founded the organization in 2012, and it has gone national, helping youngsters across the country own their first pair of skates. Kosiner’s alma mater, Ryerson, has opened a skate drop-off at the Mattamy arena to help youngsters from downtown neighbourhoods such as Regent Park and St. James Town experience the joys of skating. 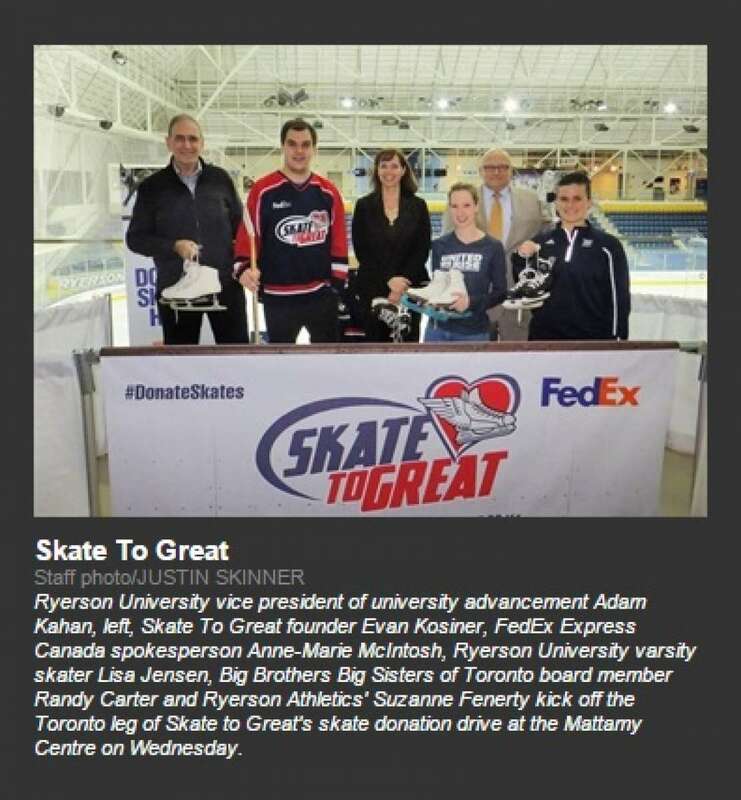 The school’s Rams in Training – named for the Ryerson Rams sports teams – has benefited from Skate To Great’s work. “The kids who come here don’t have their own hockey equipment so they rely on people like Evan and Skate To Great and the NHLPA to get everything they need,” said Ryerson Rams hockey player Suzanne Fenerty. Skate To Great is supported by FedEx Express Canada, which transports skates free of charge to ensure they get to the kids who need them. Skate To Great has also forged a partnership with Big Brothers Big Sisters of Toronto (BBBST). According to BBBST board member and Toronto Police Services superintendent Randy Carter, youngsters in that program have a year-end party at Mattamy arena, with Kosiner’s organization supplying many of the kids with skates. FedEx Express Canada has also set up a skate drop-off at its downtown location at 215 Lakeshore Boulevard East, where it will collect gear until May 4. “We’re really hoping people drop off their unused skates to help give more kids a chance to play,” Kosiner said. “The volunteer organization, Skate To Great, has opened a donation site at FedEx Express in Saskatoon for a week. The Canadian charity collects new and used hockey and figure skates, as well as sticks and helmets for local charities, schools and community groups. Kosiner said hockey and skating programs are expensive, so some kids aren’t able to participate. Skate to Great is designed to give kids in need the opportunity to play. He said people can drop off gently used equipment at FedEx Express, 3703 Millar Avenue, from February 13-20. The equipment will be passed on to local programs. Kosiner said Skate to Great has distributed more than 6,000 pairs of skates in the past two years. “When Evan Kosiner, a vivacious and focused 27-year-old from Toronto, speaks about his passion, his voice brims with enthusiasm. “I just love doing this; it is so rewarding,” he says during a phone conversation from his hotel room in Winnipeg. He is on a seven-city whirlwind tour of Canada sponsored by FedEx in support of Skate to Great, the charity that Evan founded three years ago. Evan is visiting major Canadian cities to bring awareness to the program and to kick off a weeklong skate drive. 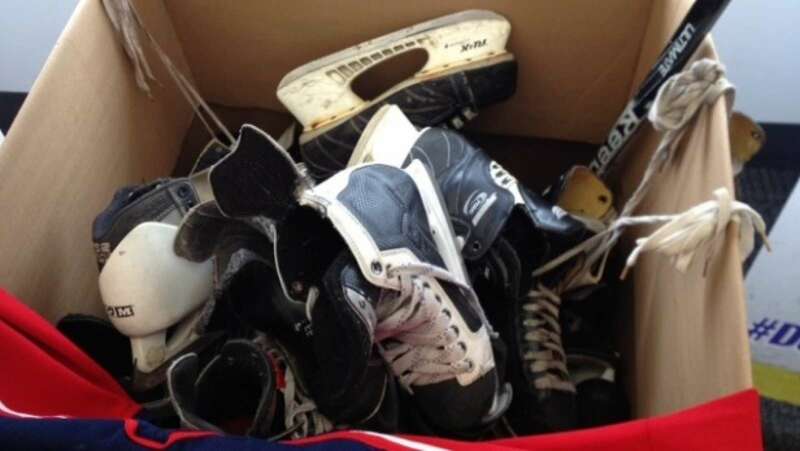 People can donate their gently used hockey and figure skates, as well as all of the other stuff — hockey sticks, helmets and goalie equipment. This young entrepreneur has several businesses and projects on the go (he’s directing and producing a movie; he owns a radio station and an audiovisual and printing company), but in his spare time he throws himself into giving back to the community through sport and in particular through Canada’s national pastime, skating. “Business is great and I love it, but for me, there is nothing more rewarding than being able to give back,” he says. Skate to Great recycles gently used figure and hockey skates, helmets, hockey sticks and hockey equipment by collecting them and distributing them to other charities, community programs and schools across the country that are working with kids. “Our mandate is to ensure that every kid in Canada has the opportunity to go skating and to learn to skate no matter what their circumstance,” says Evan, adding his research shows that many Canadian children don’t have the opportunity to learn to skate. “It could be because of financial reasons or because of disabilities, but regardless of the reason, everyone should be able to try it,” he says. The charity empowers other programs, ensuring that they have what it takes to get the kids out on the ice. It has partnered with organizations like Big Brothers and Big Sisters and Courage Canada, a program that works with visually impaired children. And making the whole concept fly, FedEx jumped on board, volunteering to ship all of the donated skates and equipment to wherever they need to go across the country, for free. The logistics of running the charity can be a bit complicated and definitely time-consuming, and everyone who helps out volunteers their time. “What makes it all worth it is when you see the kids on the ice for the first time and their eyes light up and they are smiling. Kids just get to be kids when they are out on the ice,” says Evan, adding that giving the gift of skating was something that hit home for him personally. “We had two rinks in our elementary schoolyard, both within 200 feet of each other. We would have games of shinny every day after school. It was great,” he recalls. And he is not alone when it comes to fond memories of time spent on a community rink. Skating is the iconic Canadian winter pastime. When I mentioned this initiative to my 15-year-old daughter, Lauren, and her longtime friend Dani, their eyes shone. “That’s so cool,” they chimed. 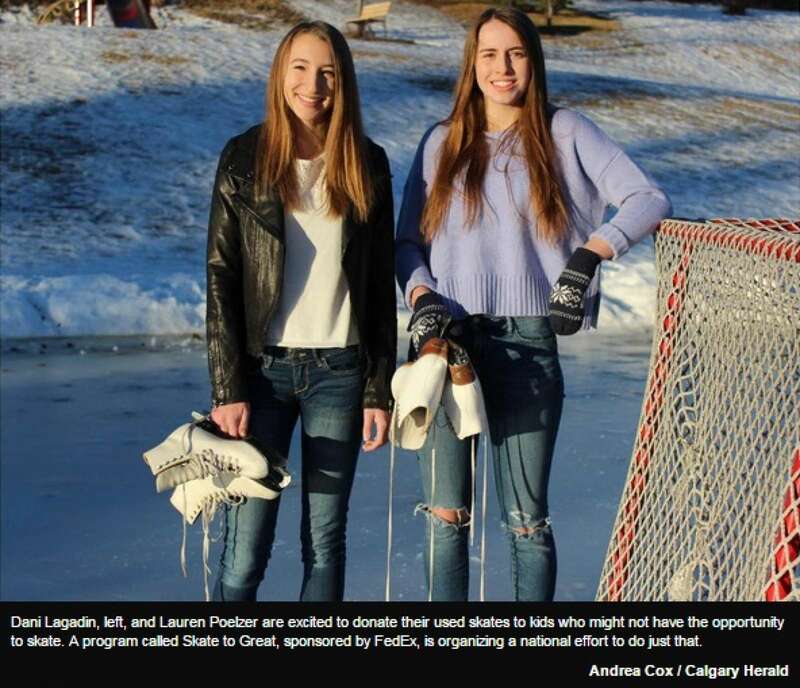 Both of the girls grew up skating on our inner-city community rink, hanging with friends and enjoying the outdoors — a rink hand-crafted every year by local volunteers in the neighbourhood. But not only that, our basement storage room (I’m sure like many others) is lined with gently used skates in almost every size (my daughter figure skated for years), all neatly propped up and polished. After I told my daughter about the initiative, she bounded downstairs to suss out a few pairs, excited about the thought of donating them. Evan says that so far Skate to Great has collected and distributed more than 12,000 pairs of skates. The Skate to Great Calgary skate drive kicked off this week at the FedEx Express terminal, located at 24 Aero Dr. N.E. It’s one of four collection sites in the city. Other sites include Play It Again Sports (both locations) and StorageMart. You can drop off gently used figure and hockey skates, helmets, sticks and hockey equipment at any of the four collection locations until Feb. 27. And when you drop off your skates, feel free to snap a picture and Tweet @FedExCanada using the hashtag #DonateSkates for a chance to win prizes and to raise awareness of the skate drive. “Youth who want to learn how to skate but don’t have the means to get on the ice is what sparked a national campaign to pair gently loved skates with at-risk and disabled children. Although it’s recognized as the national pastime, hockey and skating can be prohibitively expensive – especially for parents who can’t afford to register or pay for equipment that has an average cost of $740. That cost can be even higher for goalies, according to Evan Kosiner, Skate to Great founder. The charity’s national campaign has had stops so far in Edmonton, Calgary, Halifax and the Vancouver event will see donations of skates and hockey equipment being accepted from Feb. 23 to March 2. “I couldn’t imagine a kid not being able to go skating due to financial circumstances or got a disability,” he said. Kosiner had the idea for the charity through a conversation he had with an Olympian during the 2010 Vancouver Olympics. After doing some research, he found that while there were grassroots campaigns done by communities and schools, they often didn’t have the resources in place to reach all the children in need. In March 2012, Skate to Great was formed with the mission to get a pair of skates on every kid’s feet. 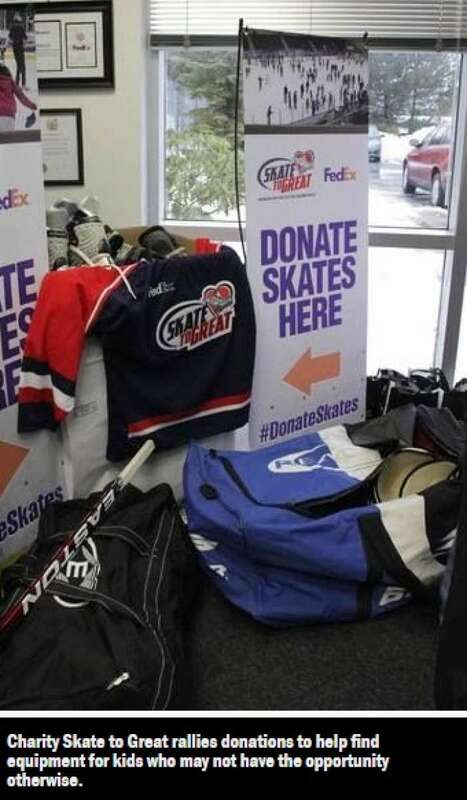 Donors have a chance to win prizes by tweeting a photo of the donation with #DonateSkates at FedExCanada. 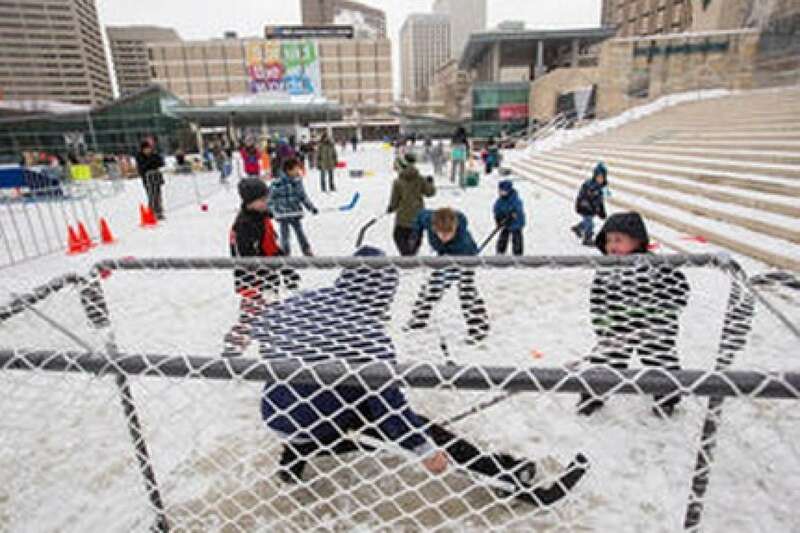 Dean McDonald plays goalie as kids play hockey during Family Day at Churchill Square in Edmonton, Alta., on Monday, Feb. 16, 2015. Family Day events were held across the city. Ian Kucerak/Edmonton Sun/ QMI Agency. “Skate to Great is taking unwanted hockey equipment out of basements and putting it into the hands of kids in need. “Skating should be a right and not a privilege in Canada,” said Evan Kosiner, chairman and co-founder of Skate to Great. The average cost of hockey equipment for a child can run anywhere from $740 for an average start-up set and up to $3,000 for goalie equipment, putting participating in organized sport out of reach for families already struggling to make ends meet. Started in March 2011 in Toronto, the group collected 500 skates. Since then, Skate to Great has donated 6,000 pairs of skates over the last two years in eight cities across Canada, distributed through various existing charities like Sport Central, 11847 Wayne Gretzky Drive, in Edmonton. “To receive this from Skate to Great, with the help of FedEx, is really awesome for us because it means more kids we can put into sport who can’t afford it,” said Sheldon Oleksyn, executive director of Sports Central. While Sport Central outfitted thousands of kids aged three to 17 with equipment last year, Oleksyn says demand is only growing, especially for hockey helmets in good condition. 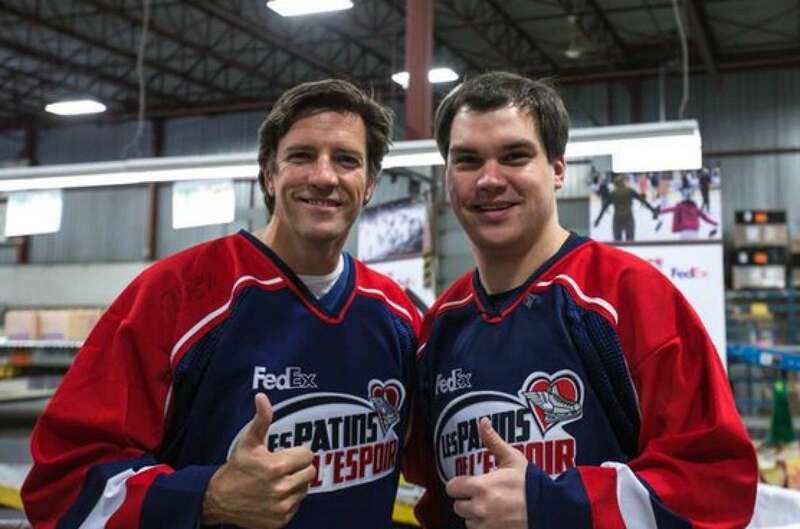 Teaming up with FedEx Canada — providing shipping services free of charge to help connect kids with the equipment they need — Skate to Great will be collecting gently used sporting equipment from Feb. 19 to 26. 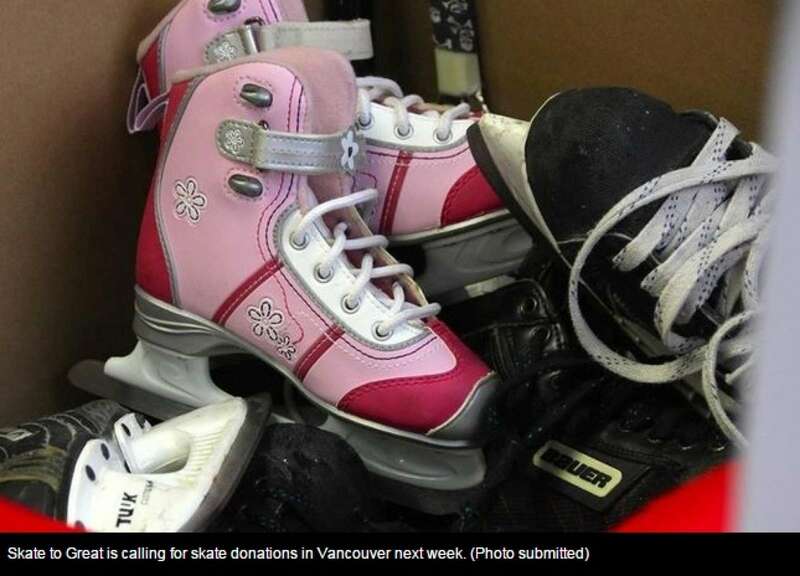 “Starting with the premise that a chance to skate is the right of every Canadian child, national charity program Skate to Great has found new feet for at least 6,000 gently used pairs of skates in its nearly three years of existence. Starting Wednesday, you can help add to that total. The FedEx Express location at 1950 Sargent Ave. will have a “mini-rink” to collect hockey and figure skates, along with helmets, sticks and pads, from Feb. 18-25, with Skate to Great co-founder Evan Kosiner and others on hand Wednesday from 11 a.m.-noon as part of a national drive. FedEx helps redistribute the equipment to schools, programs and charities here and across Canada that give deserving kids and at-risk youth the chance to skate. “I don’t think there’s anything more Canadian than this. It’s lots of fun and it brings people together,” Kosiner said. The 27-year-old serial entrepreneur from Toronto started what’s now a registered charity with friend Kaitlyn Weaver, a Canadian ice dancer originally from Houston who won a silver medal at the 2014 worlds with partner Andrew Poje. Kosiner, who received the Governor General’s Caring Canadian Award in 2013 for helping bring a number of independent programs together, said there are life lessons to be learned with skating that kids might not get anywhere else. Knowing you’re likely going to flail and fall before digging in and refusing to fail can help remove a mental barrier when facing other challenges. Kosiner spoke over the phone from Toronto after returning home from an event in Saskatoon. He’s taken a month off to volunteer, and others are giving their time because they believe in the cause. They don’t even have hired staff. “It’s grassroots to the extreme,” Kosiner said. “One year after winning a silver at Sochi, figure skater Kaetlyn Osmond’s busy making sure the least likely kids slap on the blades. The Olympian and Canadian champ made a stop in Calgary Friday to kick off a week-long effort here to collect skates for kids who’d otherwise be unable to afford them. “We’re hoping to collect as many as we can — if we could get 1,000 pairs, it’d be fantastic,” said Osmond. So far, the Skate to Great campaign has picked up 6,000 pairs of hockey and figure skates throughout Canada, which are then picked up and delivered to those who need them by FedEx Canada. Joining Osmond on Friday was former Calgary Flames centre Brendan Morrison, who delivered the first Calgary pair. Donors shouldn’t expect a beaten-up pair of skates to be accepted at the drop-off point, a mini-rink constructed at 24 Aero Dr. N.E., said Osmond. “They should be gently-used so they’re still wearable and safe on ice,” said Osmond, adding most skates donated so far in the rest of the country have been freshly-sharpened. FedEx came on board with the hope of bringing the joys of skating and hockey to those in position to purchase the often pricey equipment, said company spokesman Ken Ralph. “Skating can be pretty expensive and this kind of removes the barrier,” said Ralph, senior operations manager for FedEx Express. Skates collected in the Feb. 20-27 drive will go to underprivileged kids in the Calgary area, he added. “It’s been really successful…hopefully, we’ll see some results here in Calgary,” said Ralph. “Jouer au hockey, c’est dispendieux. Pour une saison régulière, il peut en coûter plus de 1500$ pour chaque enfant. Un obstacle financier qui peut en empêcher plusieurs de fouler la glace. Pour remédier à la situation, la campagne Les Patins de l’espoir récolte les patins et les accessoires de hockey usagés afin d’en faire dons à des apprentis patineurs qui n’y ont pas accès. Chaque année, les inscriptions de base pour une saison régulière, qui se déroule d’octobre à avril, sont d’environ 400$. La majorité de ces coûts couvrent la location de la glace. Des frais supplémentaires de plus de 350$ sont également exigés pour les dépenses d’équipe, soit les rondelles, les bouteilles d’eau et les inscriptions aux tournois. Ceci, sans compter le prix de l’équipement, qui s’élève en moyenne à 740$ pour un joueur régulier. Un montant qui s’avère encore plus dispendieux pour les gardiens de but. C’est pour atténuer ces coûts que la fondation Patins de l’espoir a démarré l’an dernier. Plus de 6000 paires de patins, accompagnées de casques et de bâtons, avaient été distribués à travers le Canada. Le 27 janvier, l’organisme a donné le coup d’envoi à sa deuxième campagne dans l’arrondissement de Saint-Laurent, avant de partir pour une tournée de six grandes villes canadiennes. «Je trouve cette initiative extraordinaire», s’exclame l’ex-joueur des Canadiens et porte-parole de l’événement, Patrice Brisebois. C’est une initiative qu’applaudit Robert Samoszewki, président de l’Association de hockey de l’Île-Bizard. SEVERN, Ont. — Not only is cottage country getting a year-round jolt of its children are getting some good sill in time for the holidays, too. On hand at West Shore Beach Club, a gated community being built by Summerhill Homes, were Skate to Great representatives, including Canadian figure skaters Piper Gilles and Paul Poirier, fresh off two silver medal-winning performances in Kelowna in October and Bordeaux, France a few weeks ago. Skate to Great collects used skates, hockey helmets and sticks to distribute to children in need, regardless of economic or physical circumstance, and will be partnering with West Shore Beach Club to donate skates to children in the Barrie and Orillia regions. “It’s a great thing to be able to give kids the chance to try skating if they can’t afford it,” said Gilles. “We’ve been fortunate to have parents who support us and pay for our equipment, although my first pair of skates were hand-me-downs, so it’s nice to be able to give other people a chance to enjoy a sport that we love. The skating duo have been aligned with Skate to Great since its 2011 inception because, not only is there potential to grow the sport they love in a country wherein skates are intrinsic totems, but it will help overcome financial barriers that impede youth participation in recreational sport. 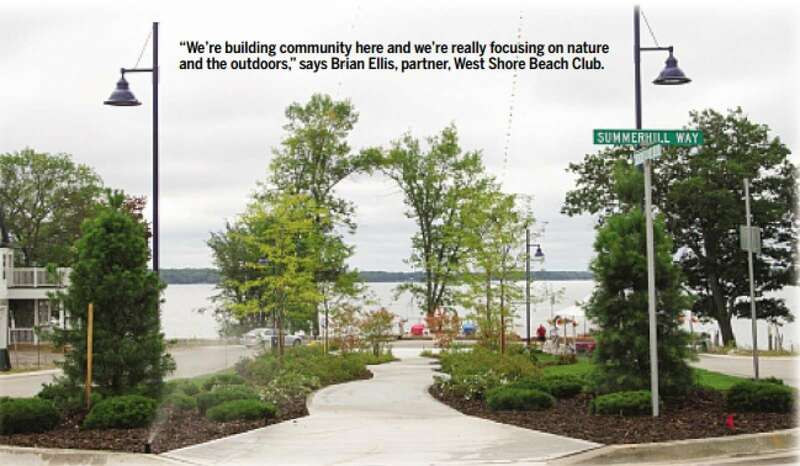 West Shore Beach Club is comprised of 76 Muskoka boathouse-style bungalows, some with lofts, that are fully detached and range between 1,001 and 2,500 sq-ft. Each house overlooks Lake Couchiching and is maintenance-free (including grass cutting and snow removal). In addition to nearby cycling trails, golf courses, ski resorts and, of course, ponds, West Shore Beach Club is ideal for summer activities like swimming in the shallow, sandy bottom lake, canoeing, windsurfing and fishing. on immersing oneself in natural surroundings. schools, programs and other charities in Canada that give children the opportunity to skate. Ice skates, hockey helmets and sticks can be dropped off at West Shore Beach Club’s sales office (9361 Hwy 11 N. at Greyshott Dr.) or at Summerhill Homes’ head office in Richmond Hill (20 Wertheim Court, Suite 17) until Feb. 28. Skate to Great is a not-for-profit organization that pairs donated new and used skates and hockey equipment with deserving children. Skate to Great also provides free programs that creates skating opportunities with accomplished hockey players and figure skaters, whose purpose is to instruct and inspire children who are most in need.